CARRIE FISHER HAD a mixture of drugs including cocaine and ecstasy in her system when she suffered a fatal mid-air heart attack, a coroner’s report revealed today. 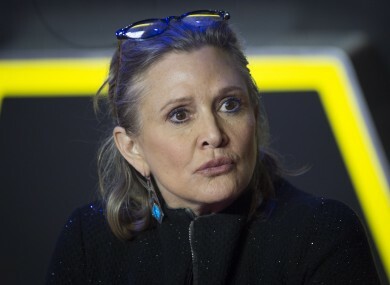 The “Star Wars” actress – who catapulted to stardom in the role of rebel warrior Princess Leia – was rushed to hospital in Los Angeles on 23 December after collapsing on a flight from London and was pronounced dead four days later. There were quantities of alcohol and opiates in her system, according to the toxicology report, which said the tests suggested “exposure to heroin, but that the dose and time of exposure cannot be pinpointed”. “Therefore we cannot establish the significance of heroin regarding the cause of death in this case,” added the report, sent to AFP by the LA County Coroner’s office. The tests revealed the cocaine would have been taken within the previous three days, according to the report, which gave the cause of death as sleep apnea – a breathing disorder – and “other undetermined factors” including heart disease and “multiple drug intake”. “My mom battled drug addiction and mental illness her entire life. She ultimately died of it,” Fisher’s daughter, Billie Lourd, said in a statement released to celebrity magazine People on Friday. She was purposefully open in all of her work about the social stigmas surrounding these diseases. Fisher’s mother, the actress Debbie Reynolds, suffered a fatal stroke the day after her daughter’s death. Email “Carrie Fisher had cocaine and ecstasy in her system when she suffered heart attack”. Feedback on “Carrie Fisher had cocaine and ecstasy in her system when she suffered heart attack”.